Hey-ho boys and girls! Before we get started this week I would like to direct your attention to your URL bar. That’s right – Hobby Hovel now has its own domain! Nifty ain’t it? Unfortunately as a result of a bug within Blogger, all the comments from my older reviews (before I switched to IntenseDebate) were knocked out. Hopefully they’ll resolve this soon… Anyhow, on with the rant! 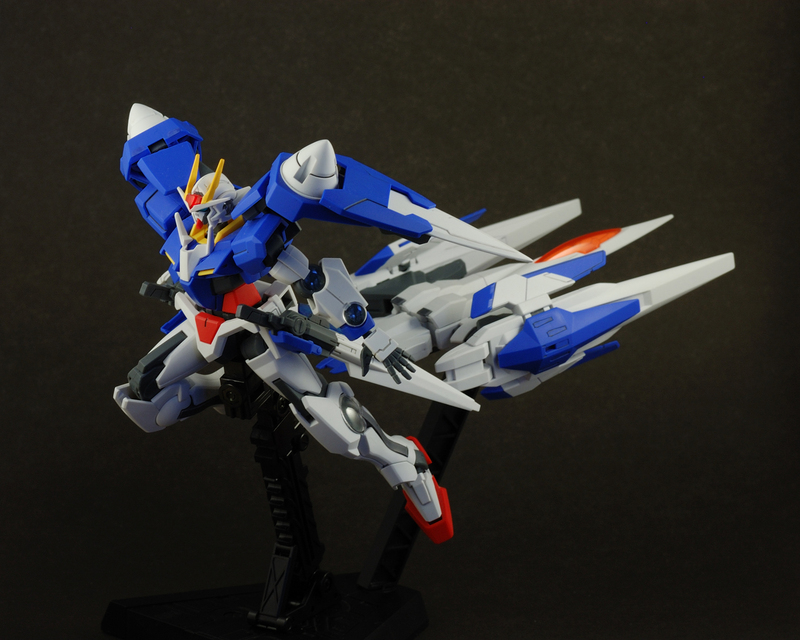 Well, lo and behold a few months later I find myself waiting for the HG 00 Gundam and 0-Raiser to arrive in the mail. 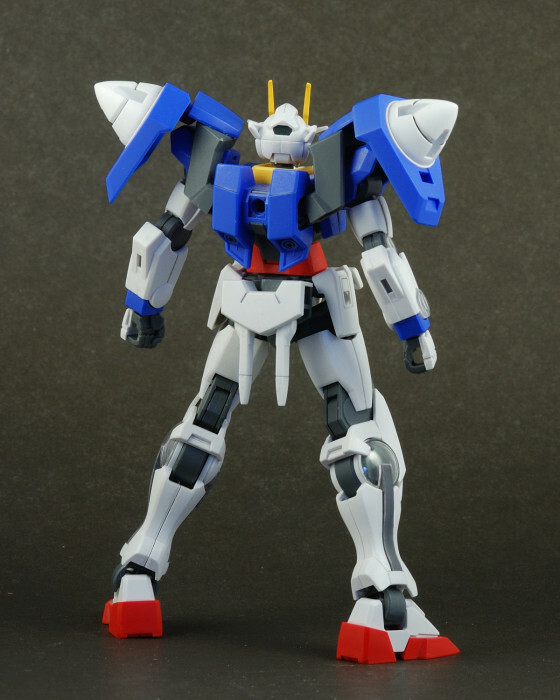 Not only did I learn to warm up to the second season’s designs somewhat, web previews of the HG models for the second season had all the innovation the mechanical designs lacked. My expectations, which were heightened greatly by these previews, were not betrayed when the models finally arrived. 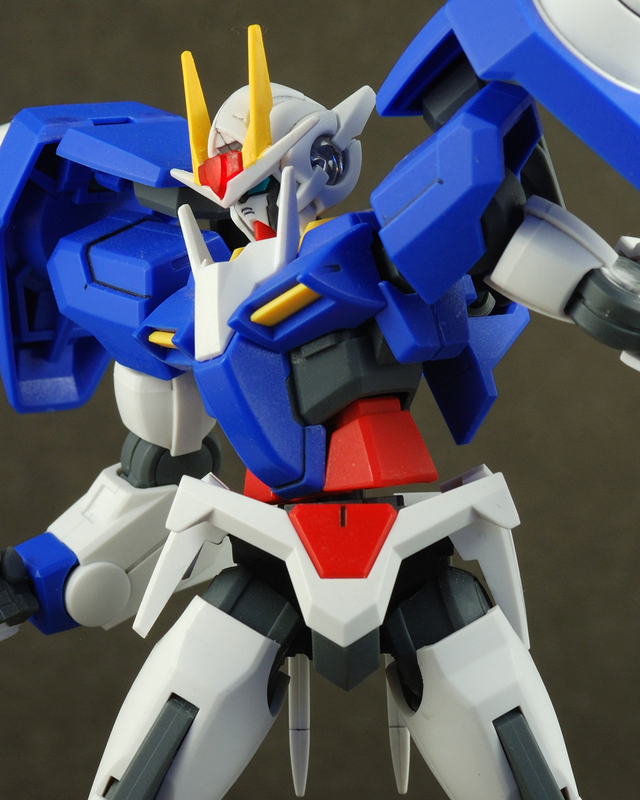 Simply put, the 00 Gundam is in a league of its own when it comes to articulation on HG models, and as long as you are willing to put a little work on painting some omitted details, these kits are must-haves. 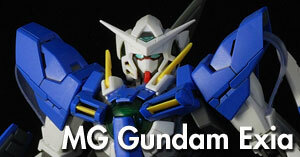 Like many other HG models, the 00 Gundam is not completely moulded in the correct colours. Unlike most other modern HG models, however, the 00 Gundam lacks the correct colours in several prominent areas. 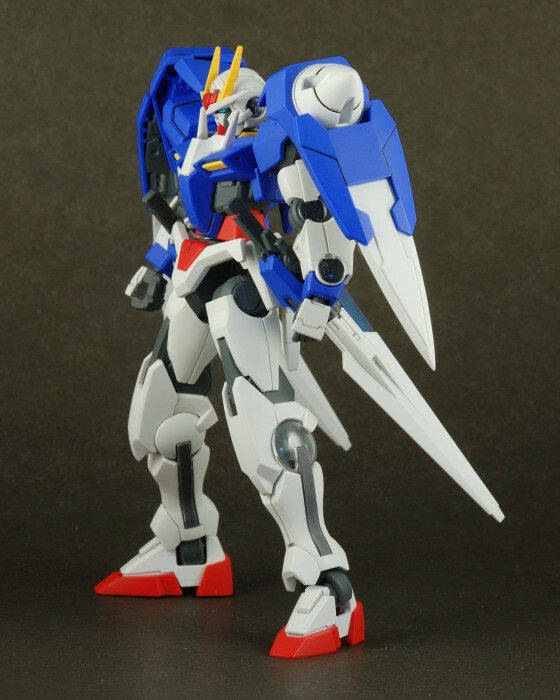 For this model I used the Gundam 00 S2 Gundam Marker set (which includes blue, grey, white, yellow, red, as well as a grey water-based soft-tip panel line marker) as well as a coloured sharpies for some of the clear parts. The red centerpiece of its head crest is moulded in clear plastic and relies on a red sticker behind it to compensate. Needless to say, this doesn’t work very well. 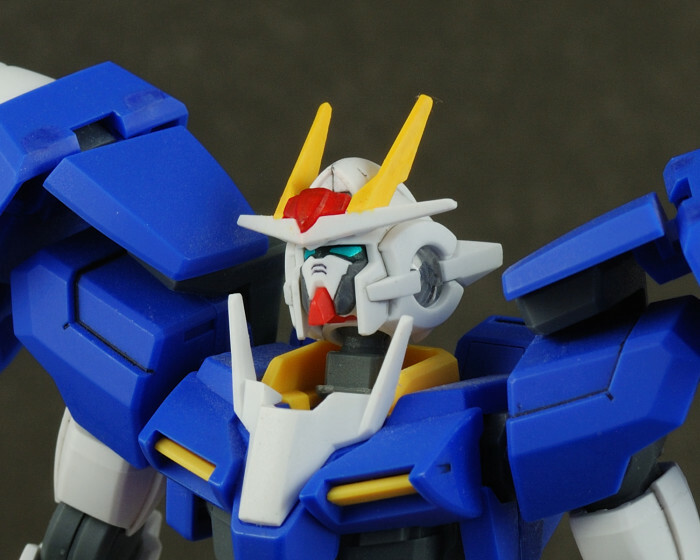 The yellow parts of the v-fin also rely on foil stickers to cover up the white plastic. 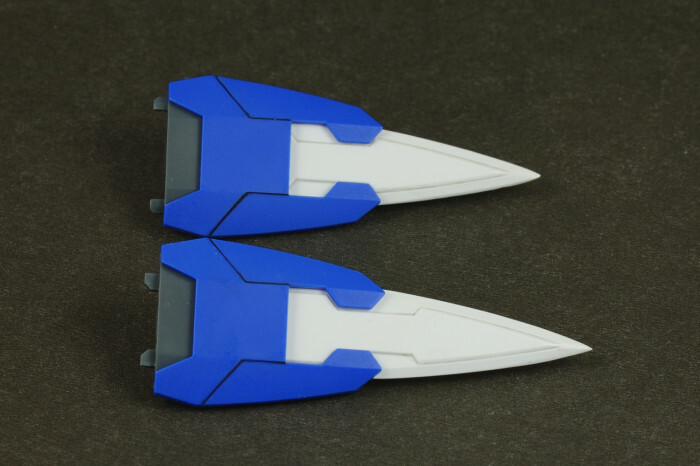 These stickers do not cover the back of the v-fin and do not look very good because of the difficulty in folding the sticker over the edges cleanly. 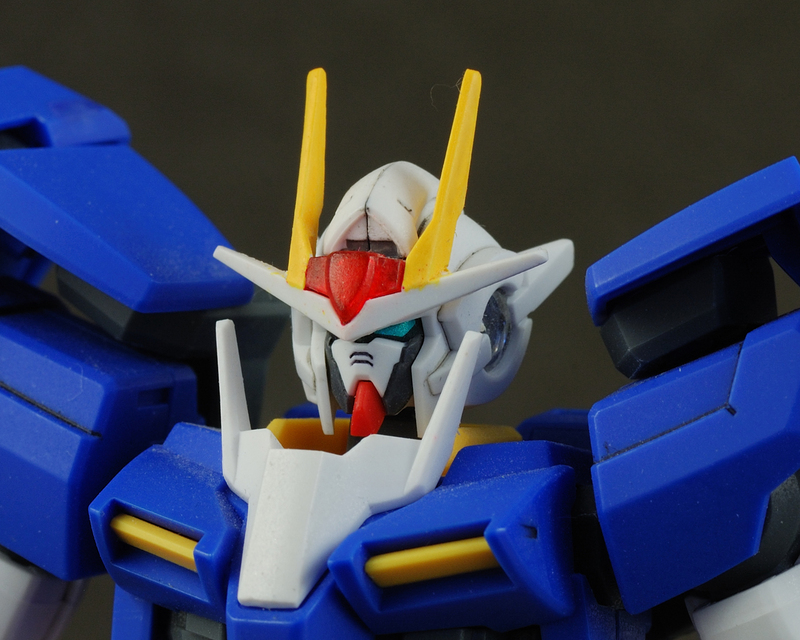 Finally, the grey parts of 00’s cheeks are ignored in this model without even so much as a sticker to deal with them. You’ll have to paint them yourself if you want accuracy. The grey stripes on either side of each leg rely on stickers to achieve the right colours. 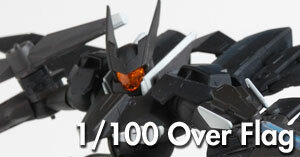 The clear circular orbs found on the head, arms, and legs of 00 use plain black stickers underneath the clear plastic panels. Ideally these should be tinted green, but they look alright as they are. 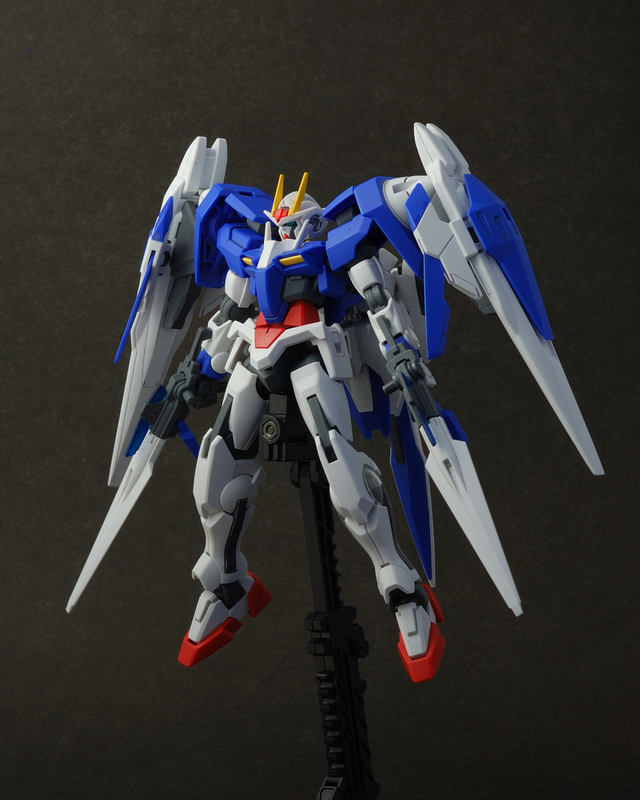 00 Gundam comes with two GN blades, two GN beam saber handles and an optional open-palmed left hand. 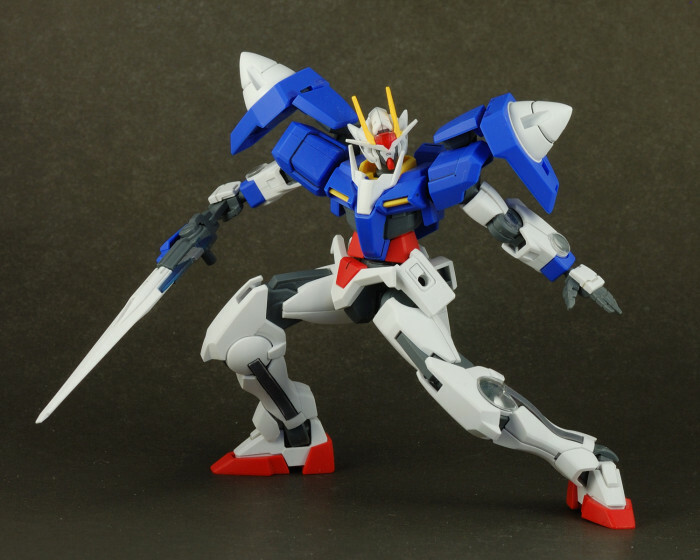 No beam blades are included here, since the idea here is to buy the models of the other suits in order to make use of the handles – a shrewd marketing ploy by Bandai. The clear portions of the GN blades are moulded in clear plastic, so additional detailing would be needed once again to achieve accuracy. Thankfully, this can be easily dealt with by using blue sharpies over the clear parts. The GN blades transform by pulling off the blade from the hilt, rotating the blades by 90 degrees and refitting them back onto the hilt. The handles separate into a miniature stock and a pistol grip, while the blue parts flip up to act as some sort of hand guard. And finally, here’s an extra open-palm hand! Whoopie! The 00 Gundam features a polycap neck which connects to the body via a pinned joint and connects to the head via a ball joint. 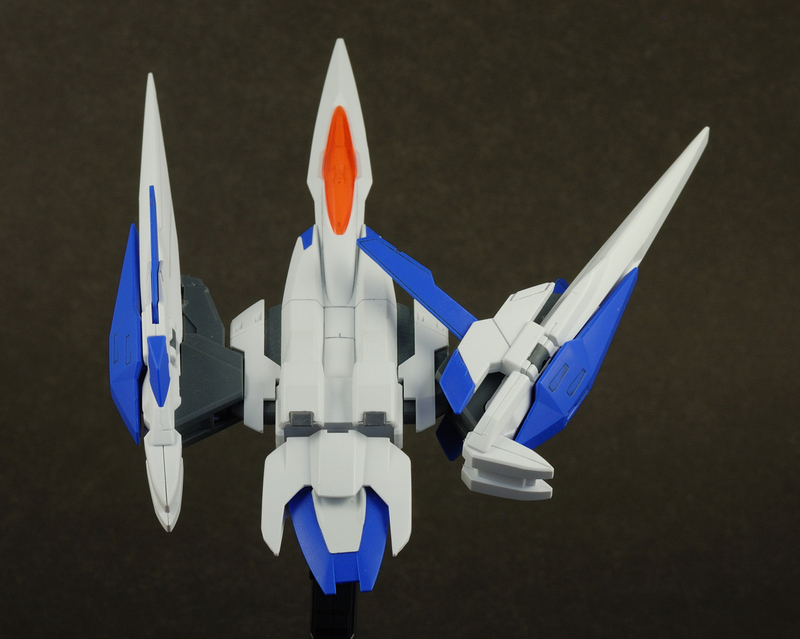 As the result, the 00 is able to tilt its head vertically very easily. The shoulder joint of 00 uses a single large polycap to serve both as a pinned joint and a ball joint. This simplifies the shoulder design while at the same time allowing for the ability for the shoulders to swing forward about 30 degrees. 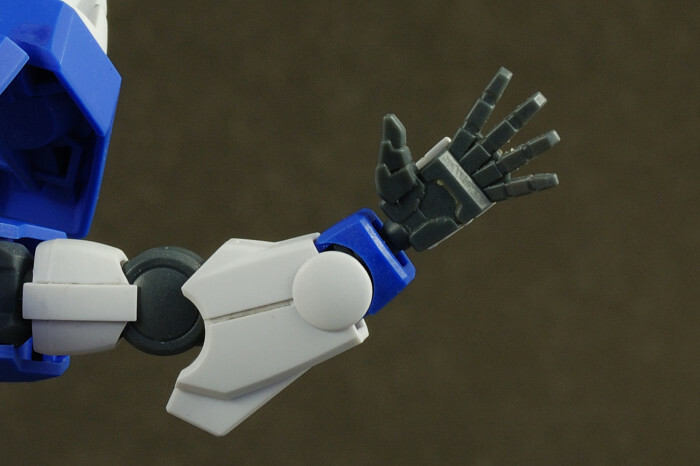 Both the elbow and the wrist joints of 00 are supplemented by a supporting joint. An auxiliary joint is located below the elbow to allow it to bend around 100 degrees forward. Another joint is hidden in the forearm, which allows the blue portion to shift slightly back and forth. Each hand is a simple two-piece construction consisting of the hand and the white plate covering the back of the hand. This simple design does not work well in the long run as the holding strength for the weapons wear off and plate becomes more prone to falling off under slight pressure. The GN drives linked directly to the back of 00 Gundam through a set of two arms. 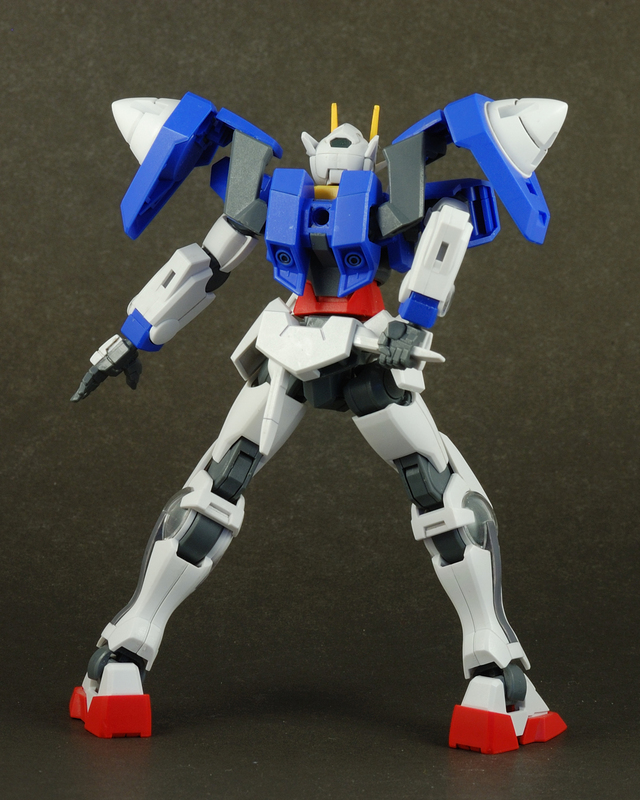 The base of the arm is secured by a ball joint, while two swivel joints connet the end of the arm to the actual GN drives. This configuration allows the GN drives to be placed in virtually any position with ease, even directly in fron to the shoulders. The waist is also double-jointed with one joint located in the core of the torso and one connecting the upper body to the hips. 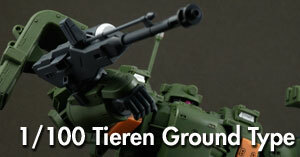 While the 00 is still not exceedingly flexible in the waist, it does have an advantage over most other single-jointed HG kits. A centre axis in the hips allows 00 to put one leg forward and one leg back. 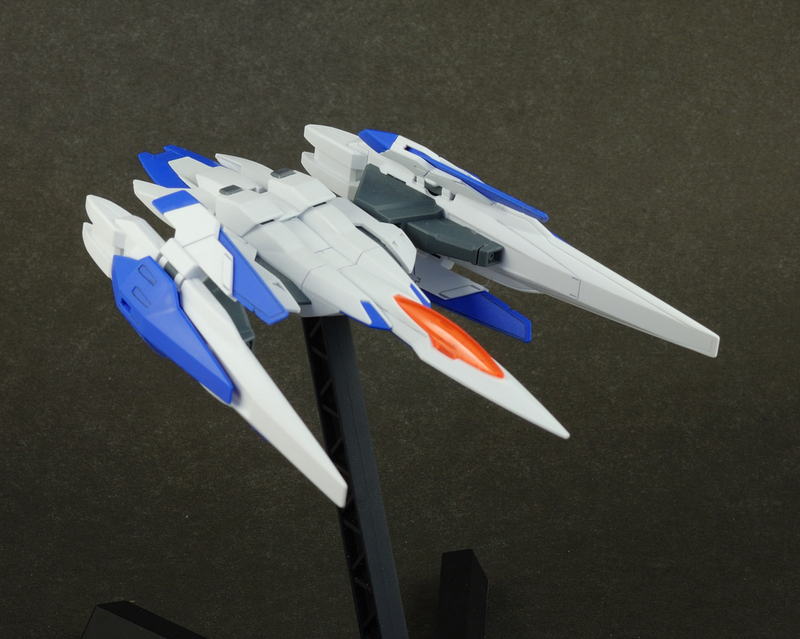 This central point also accepts the peg for Bandai’s Action Base 2. The side plates on the hips mount the GN blades via simple, polycap-less holes, while the back piece holds the GN beam saber handles either on the bottom or at the sides. 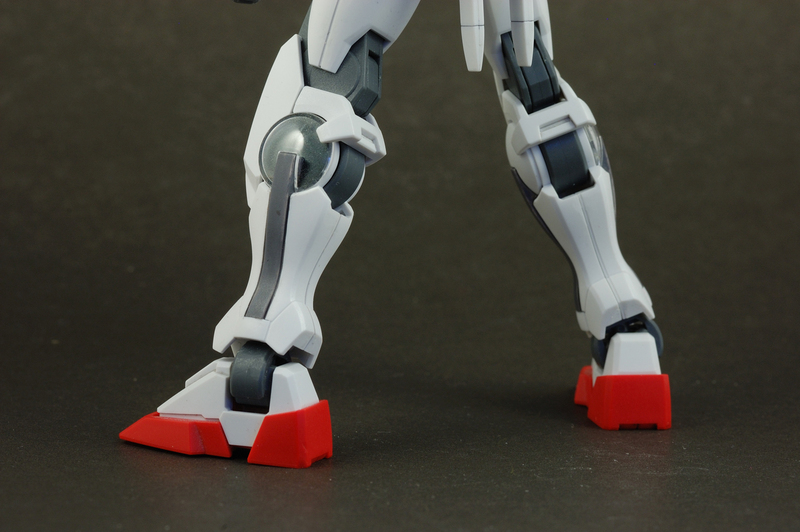 Once again, the legs are double jointed above the knee and around the circular feature of each leg. 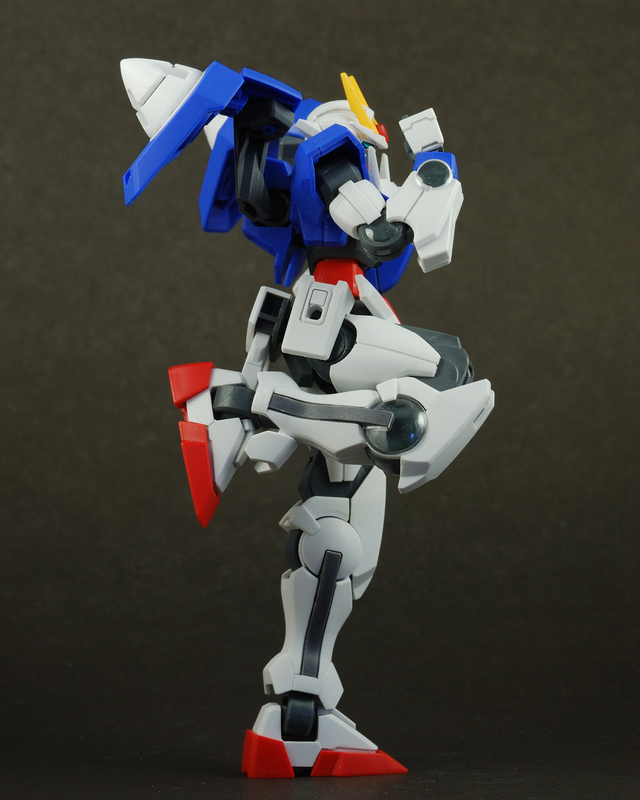 The upper thigh joint is also designed to afford maximum side movement, and with the lack of obstructive tasset armour, sky is the limit when it comes to leg articulation for the 00. The ankles of 00 are probably its biggest innovation. Rather than relying on the traditional ball joint, the 00 combines two single-axis joints to not only offer front/back articulation, but also unrestricted side-to side articulation. The armour on the bottom of the shins can also be flipped open if extra movement space is needed. 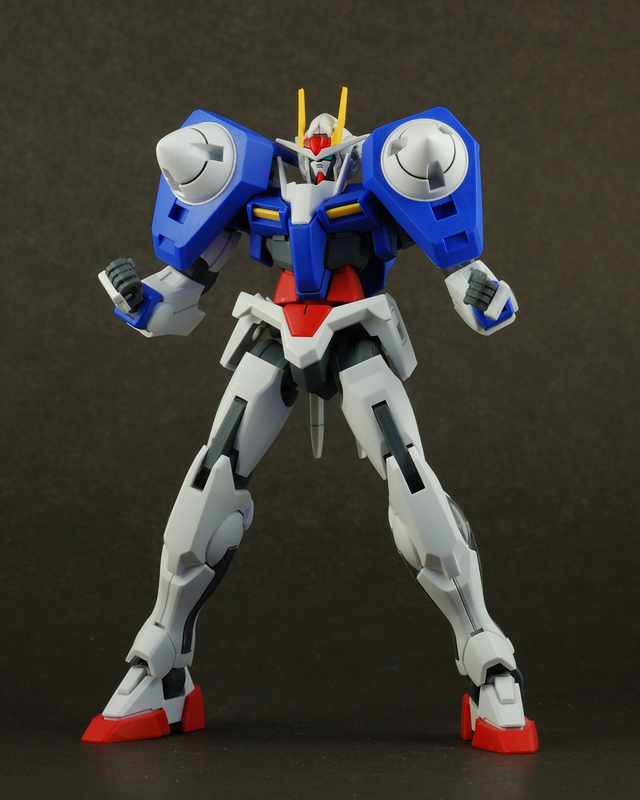 Like the 00 Gundam, the HG 0-raiser also has some colour discrepancies here and there. For a complete rundown, click the photos below and refer to the notes for the places where paint/stickers are required. 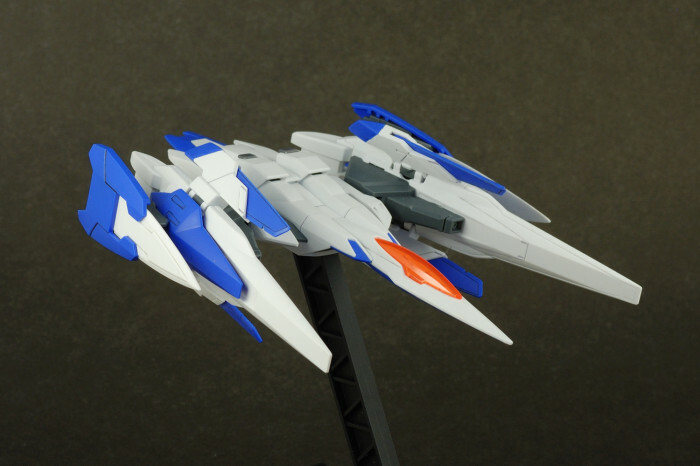 But with the exception of the white center of the tail thrusters, they are not very conspicuous. The 0-Raiser comes with the shield of 00 gundam, which can be mounted on its arms (separately or combined), on its GN drives, or on the binders of 0-Raiser. 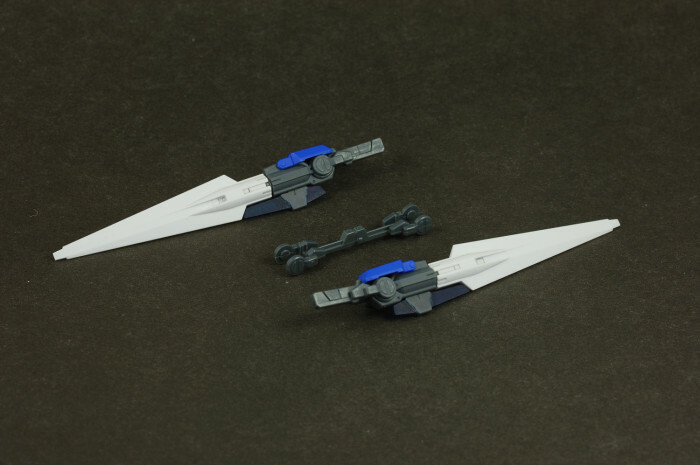 The bladed parts of the shields are able to extend and retract slightly. Also included is a combined handle for the GN blades as well as a simple display base, which also can be combined with the Action Base 2. As for articulation of the 0-Raiser unit, the blue part of the back thrusters on the main body is able to move slightly to each side.The back thrusters of each binder are able to move around 95 degrees to either side. The flaps holding the small wings are able to bend 90 degrees inwards and the wings themselves can be flipped outwards to around 85 degrees. The actual binder themselves are also able to swing slightly outward. 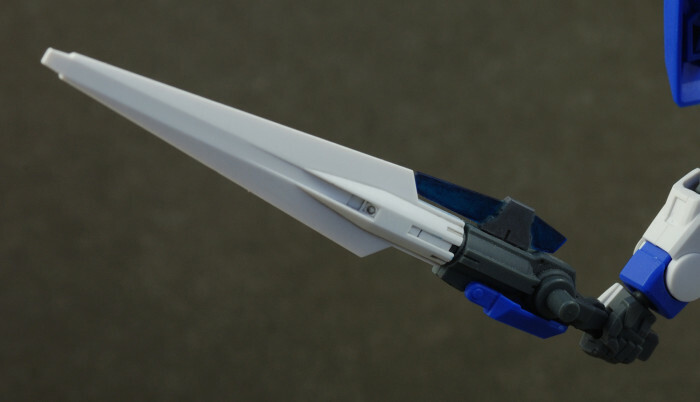 The combination of the 00 Gundam and 0-Raiser is simple: remove the binders from 0-Raiser, fold its body to reveal a peg, and use it to attach the body to the back of 00 Gundam. Then flip the clip of the wing binders to reveal a set of two pegs, which are to be attached directly to the GN drives. That’s all there is to it. As 00-Raiser, the binders ends up looking like wings attached to 00’s back. 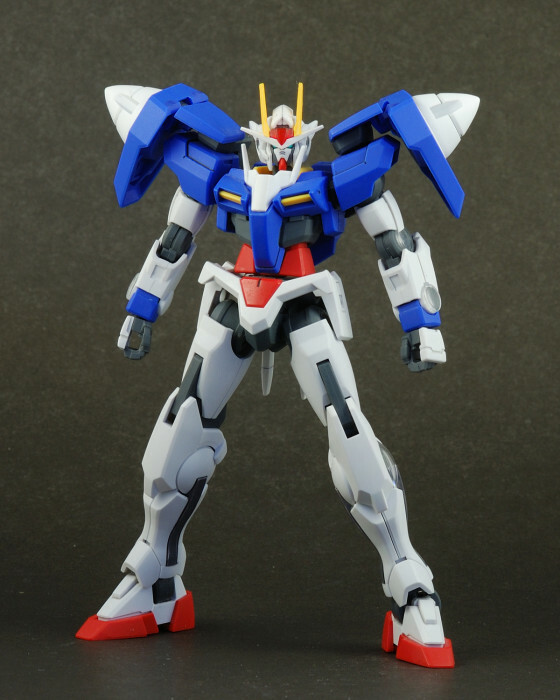 Along with the rather silly looking backpack, the addition of the 0-Raiser significantly alters 00 Gundam’s overall slim appearance and adds considerable bulk to the overall suit of the suit. 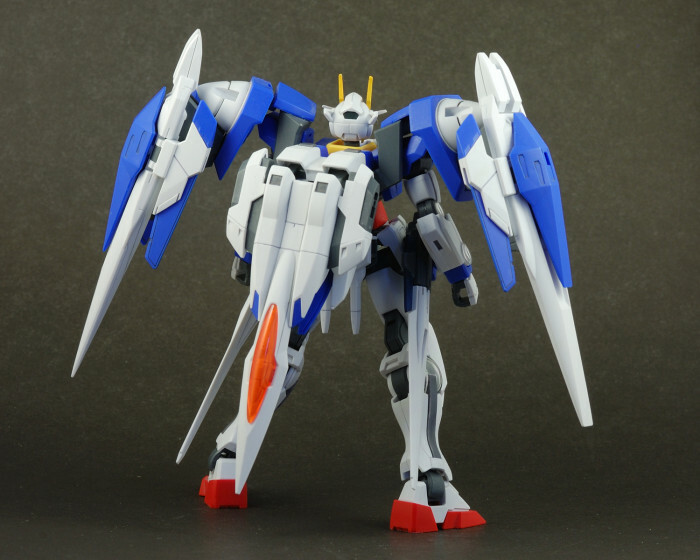 The 00-Raiser handles the weight of the large binders very well and does not suffer from the issue of loose joints suffered by its 1/100 scale counterpart. 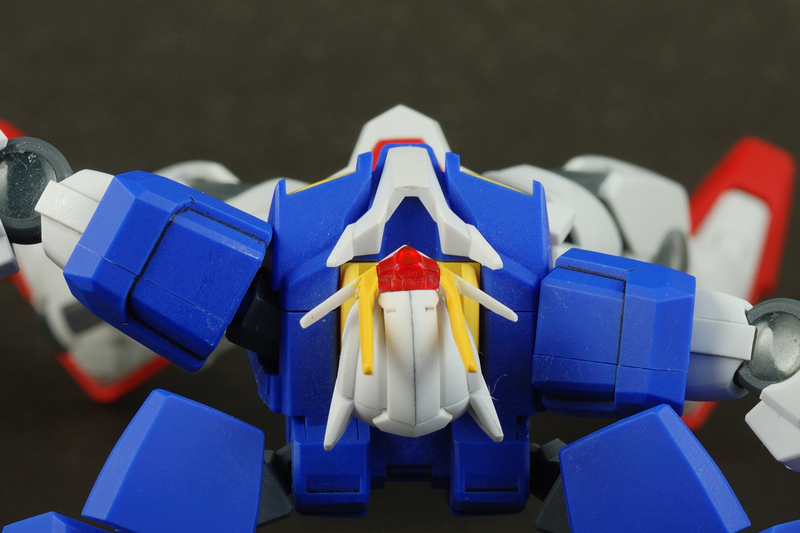 Both the body and the binders of 0-Raiser are attached firmly to 00 Gundam, leaving little risk of falling apart. 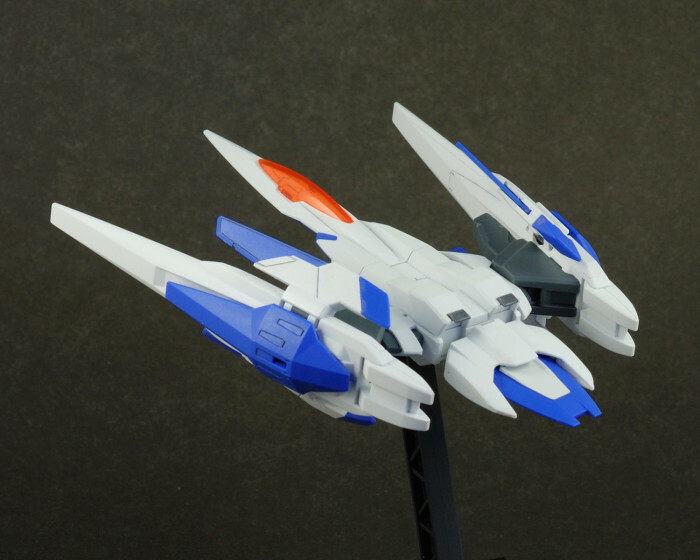 In other words, the HG 00-Raiser is not only able to position its “wings” in a wide range of poses, but also hold the pose firmly as well. 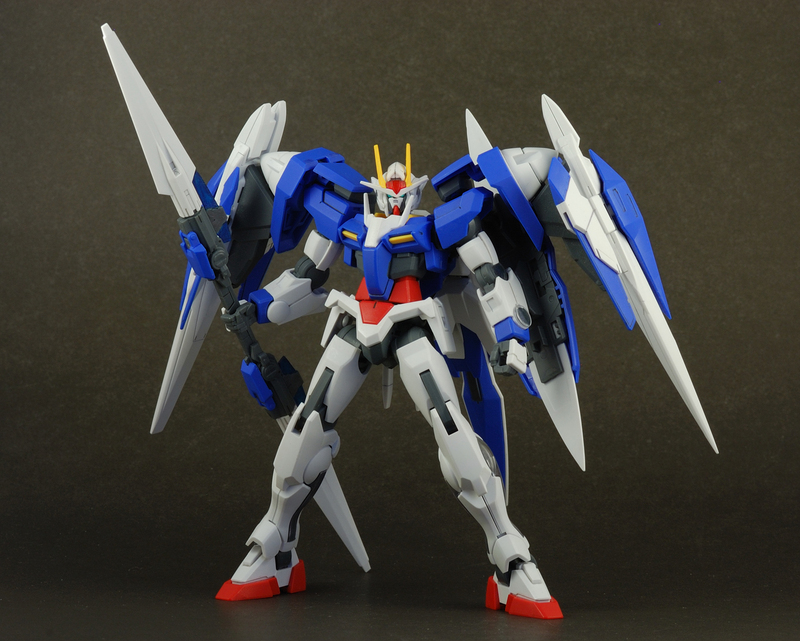 The HG 00 Gundam hold the pricetag of 1000 yen, while the HG 0-Raiser is 800 yen. 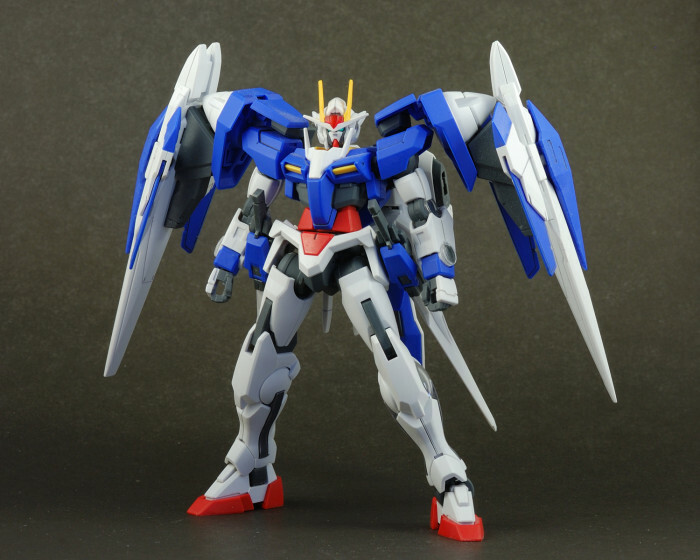 The 00 is definitely a monster bargain, but chances are if you are getting the 00, you are pretty much obligated to get 0-Raiser for the sake of completion, which doesn’t have all that many parts in the package. 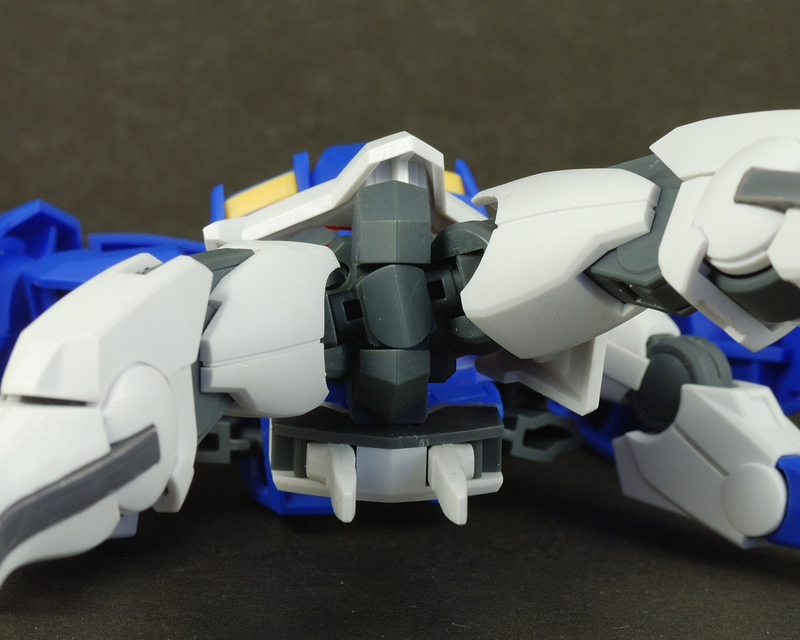 Still, all things considered, the 00-Raiser combo is a very well-designed package that features unbelievable articulation for a HG kit. 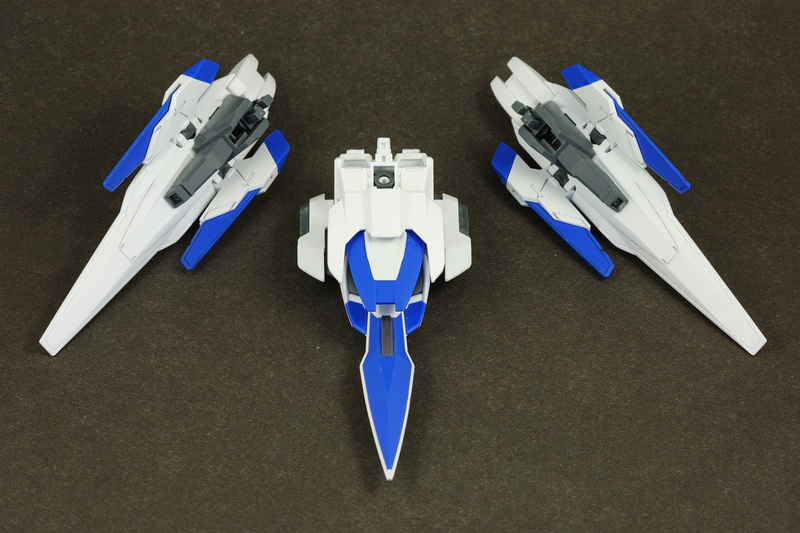 However, if you are interested in the HG 00-Raiser combo, I absolutely recommend against purchasing these two kits. 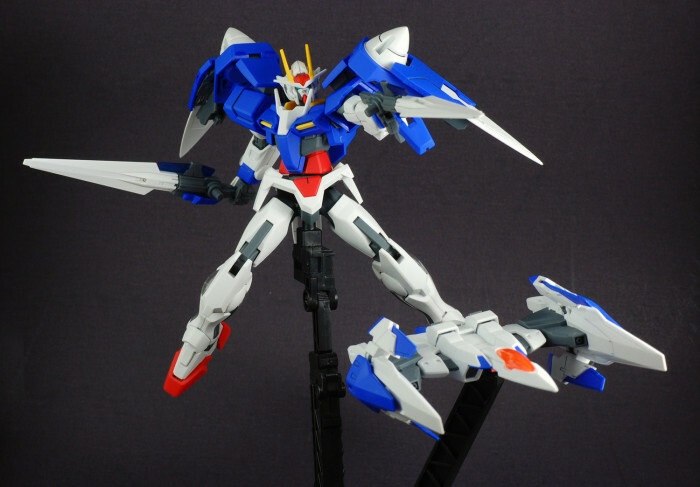 This is because there are no less than three re-released (but not redesigned) versions of 00-Raiser in production: Designer’s Colour version, Trans-Am version, and GN Sword III version, the latter of which includes the beam saber blades that were omitted, more detailed foil stickers and additional clear decal stickers for the shields, as well as the large GN Sword III, the main weapon used by the 00-Raiser near the end of the second season. In other words, it actually contains what ought to have been there to start with. 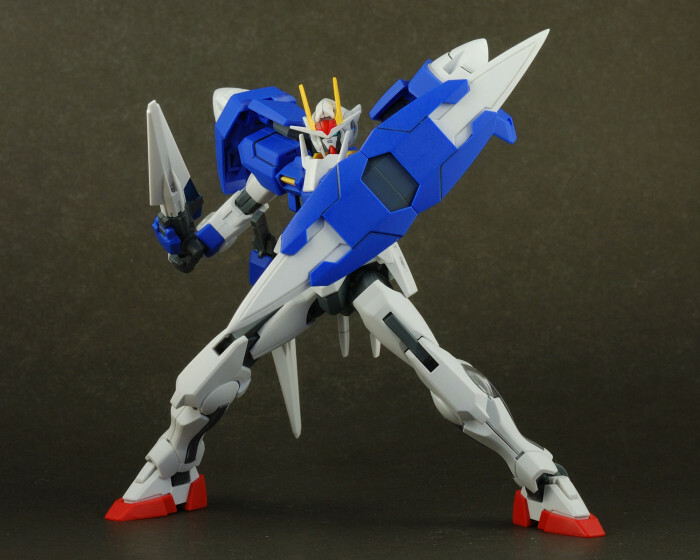 As someone who jumped at the pre-orders of the first two kits, I can’t help but to feel a little betrayed by Bandai’s marketing strategy, and I can’t help but to think of the GN Sword III as a cheap way to sell more models. 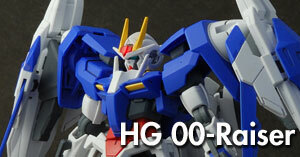 If you liked what you saw here in this review, check out the HG 00-Raiser + GN Sword III. 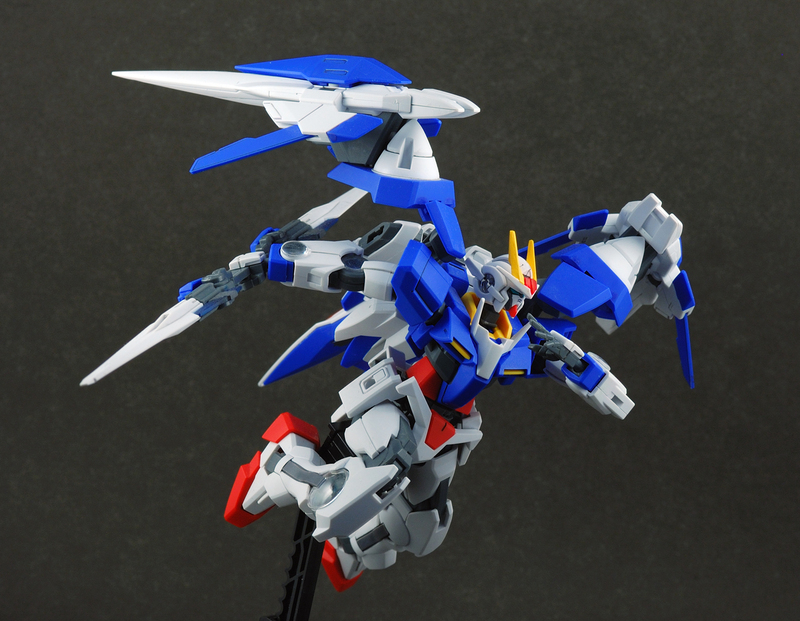 It retails for 2000 yen – 200 yen more than the combination of the two kits in this review. However, the content you receive for that 200 yen is undoubtedly worth it and is sure to make a already great kit even better.